Another one of those few stages where I’m not sure where to begin, what to put in and what to leave out. So, I thought why not start with the ArgoSunGod, Marcel Kittel? Because he’s a beast and we love him. Then it’s on to rules – unwritten, of course. Then we’re in a rather crowded recovery room before we join the gruppetto. 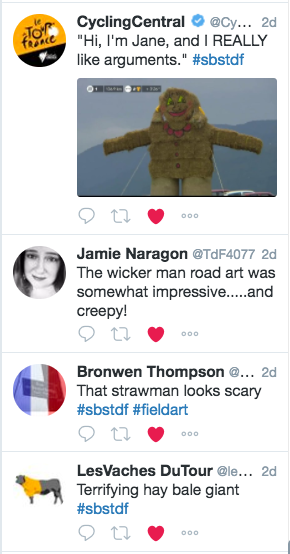 Kids, it is TOUR TWEETS OF THE WEEK! I don’t think this really needs an introduction, does it? If you do, just raise your arm. 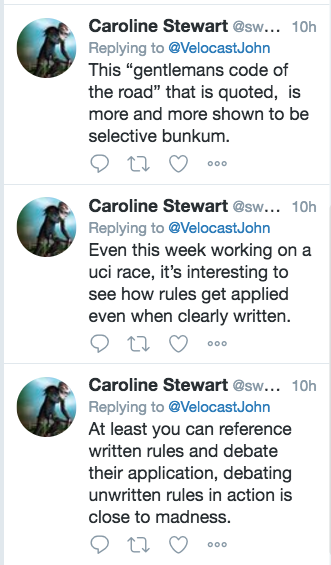 Mind you, given the cavalier manner in which the actual rules are applied it's hardly surprising folk are confused about unwritten ones. Is it time for these unwritten rules to be binned? Equipment issue? It’s your equipment choice/mechanics fault. Illness? Body failure. Perfect. I've isolated the yellow jersey. But instead of attacking him I'll help him chase the attack. Yip, just watched 2days stage. Epic. Why not leave the chase of Bardet to the yellow jersey? 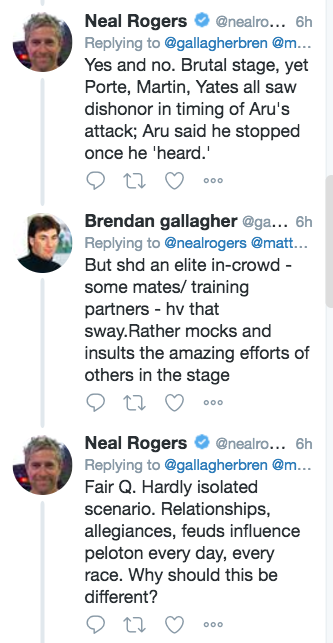 None of them think they can beat Froome for GC. They’re sniping for stage wins. Haven't watched today's stage and 100% won't be after reading some of my mates have been hurt. Really hope all who crashed today are ok.
Robert Gesink just has #unluck – he was just coming back into form after a storming stage on Saturday and went down in a crash just a few kilometres into Sunday’s stage and fractured a vertebrae. Here’s to a full recovery! 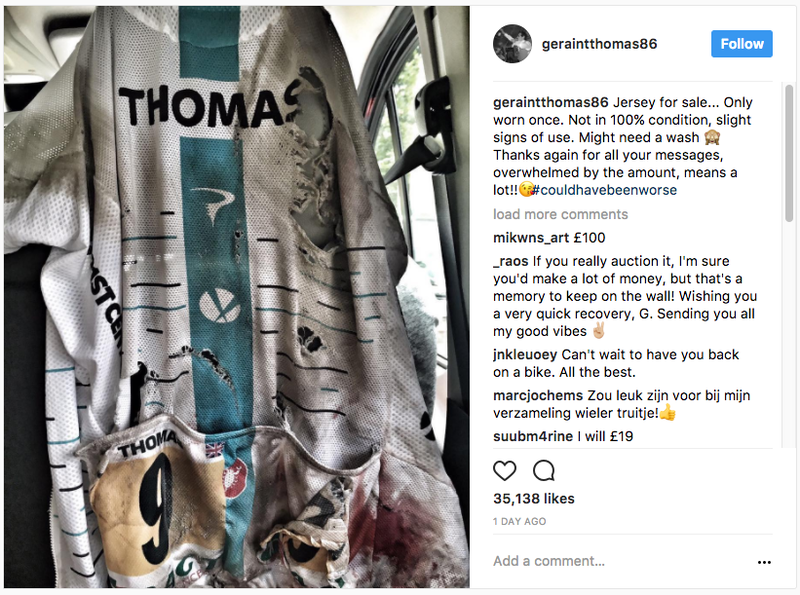 It seems that Geraint Thomas is like a magnet and the road surface is steel. He hit the pavement on Sunday … and didn’t get back on the bike due to a broken collarbone. Will he try for the Vuelta? We all saw Richie Porte‘s crash (too many times, if you ask me) and were all so worried to see him stretchered into an ambulance after getting so much treatment on the road. It was a collective sigh of relief when the news came through that his injuries – miraculously – were not anywhere near as bad as it looked. Here’s wishing him the speediest of recoveries. Oh, poor Bling. That jersey isn’t going anywhere but on the shoulders of the big blond from Germany. Michael Matthews:"I sent Richie a msg & he replied 'Bring home that green jersey & I'll be the happiest guy on earth'.I got quite emotional"
This is a very sad note. Adriano Malori has announced his retirement from professional cycling. If you recall, the Movistar rider had a terrible accident two years ago, which he never really recovered his form. We wish him the best of luck in the future and every success. This kid knows class when he sees it! The Mighty Degs is getting closer – he came in second to Kittel on Tuesday’s stage. For the French speakers among us or fans of snowy white kit. Some people have been shouting about the Mickey Mouse way the Tour has been run this year but we thought they were speaking figuratively. No way is that hat aero, Hugh. I’m all for this interpretation. Imaginary winner. Dream jersey. Make believe maillot. I hate the term "virtual yellow jersey." 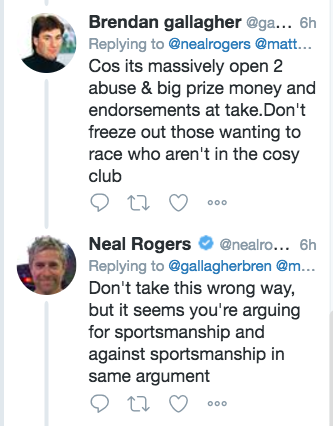 Instead, I'd like to propose "imaginary winner"
They cycle nearly 200km but they’ve still got the energy and racing spirit for this. Gotta love PhilGil – he really wanted to win! Not a tractor but a very VERY creepy piece of roadside art. I just thought this was very funny.